For the average collegiate track and field athlete, nervousness is a common component of a meet day. 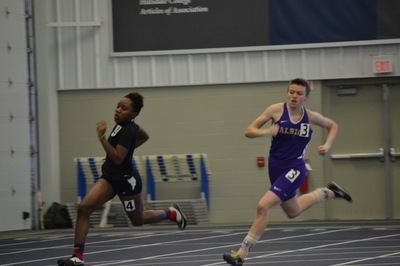 However, for senior Angela Morrison, there were a few more butterflies than normal going into the NCAA Division III Indoor Track and Field Championships in Naperville, Illinois. “I don’t think I’ve ever been so close to throwing up before a race before,” Morrison joked. Despite the nerves, the senior from Westland, Michigan, produced her second-best finish of the season in the pentathlon. In the span of one day, Morrison competed in five different events: 60 meter hurdles, high jump, shot put, long jump and the 800 meter run. An athlete’s performance in these events is judged on a point system, which eventually determines the athlete’s place in the overall pentathlon. Morrison ended the competition with 3,283 points, good for tenth place in the nation. She was three points shy of eighth place and All-American honors. “I expected the level of competition to be high; I just didn’t expect to hang with them as long as I did,” Morrison explained. Known for being a very versatile athlete in the sport, Morrison’s goal of reaching Nationals started to become a reality once she completed her first pentathlon at Hillsdale College in early February. “Granted there are only about 150 people in Division III that do the pentathlon, it was really cool to see my name higher up in the rankings,” she explained. While competing at the national stage was certainly a personal goal for Morrison, being able to represent the Briton track and field team at the same stage was of equal importance to her. Although the indoor season has come to a close, the hard work is far from over for Morrison. Morrison also has her eyes on the Albion College pentathlon record, which was last set by Kristin Nelson in 2013. “It’s never been more possible than right now,” Morrison said with excitement. Morrison will have a chance at breaking the record this spring, with upcoming meets at Alma College, Ohio Wesleyan University, Ohio Northern University, Calvin College and North Central College.